When I was little, one of the most favorite things to play with was dress-up paper dolls, which kind of explains why I love playing dress-up to this day. I love coming up with outfits with complimentary colors, and also mixing with fun novelty prints. And I love to do the same with origami models and have a collection of pretty print origami papers also. 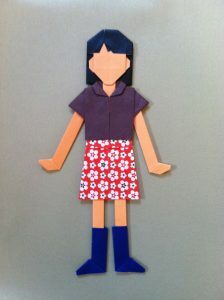 So you can imagine how I got excited when I found an instruction book on how to make dress-up paper dolls in origami. 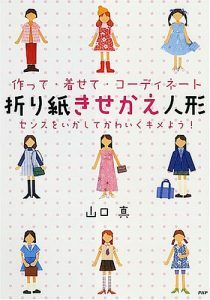 The book is called 折り紙きせかえ人形, written by Makoto Yamaguchi, a renown origami artist in Japan. Obviously, the book is written in Japanese, but the author uses the universal, Yoshizawa-Randlett diagramming system, and it is very well diagrammed so following instructions shouldn’t be too challenging, even if you don’t know Japanese. The book is available on Amazon, Kinokuniya, etc. 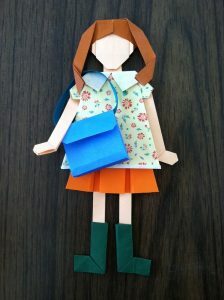 It is required to use multiple sheets, different sizes and shapes for different body parts, clothes and accessories (minimum of 8 sheets) for making one doll. But the author explains exactly what size/shape for each part and how to cut paper to a required size/shape from regular size of origami paper with diagrams and photos. 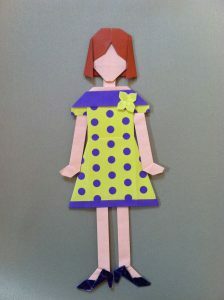 There is a wide variety of Here are a couple of paper dolls that I made, using this book as reference. This book was a big hit to some girls at school and camp where I teach. They were age between 8 and 12, semi-beginners to intermediate folders. With my help, it took each of them about two hours to fold each body part, clothes and assemble them. Here is a doll made by one of the campers. So cute! If you enjoy origami and fashion, this book will be sure to please you.